On October 31, 2011, we entrusted the 25th Earth Treasure Vase to Leslie Temple Thurston and Brad Laughlin, co-founders of Corelight, who became our good friends and collaborators during the ETV project pilgrimage to South Africa in May 2011. At that time, we planted an Earth Treasure Vase at the rim of the Blyde River Canyon along the Nilotic Meridian, which streams from South Africa to the Giza Plateau. On behalf of the ETV Project, Brad and Leslie completed what was set in motion in the spring, anchoring a vase at the other end of the meridian to secure the connection and transmission between the two. 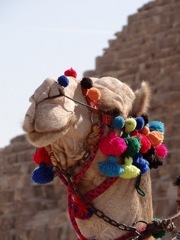 In Egypt on 11:11:11, our friends from Corelight had quite the cloak and dagger (and camel) adventure on the Giza Plateau as they attempted to bury the Earth Treasure Vase! Brad kept us up-to-date via email as events unfolded on the ground. Read on for a brief account. Greetings from Cairo. We are here, staying at our friend Mohammed Nazmy’s apartment, which has an extraordinary view of the Great Pyramid — almost like you can reach out and touch it from here. “Our baby” is fine; we all made it here safely and easefully. 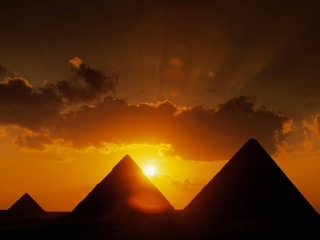 The energy of Egypt is sublime! So beautiful and peaceful and calm. We happen to be here in the midst of a weeklong sacred holiday, a celebration of when Abraham’s love of God was proved by his willingness to sacrifice his son Isaac, and God gave him a goat to sacrifice instead. We can feel the whole city holding a sacred, refined energy. We will most likely bury the vase right at 11:11pm!!! The place Mohammed has told us we can bury the vase is somewhere near the Anwar Sadat Peace Pavillion, which is not far from the Great Pyramid. We will still be doing the blessing and sealing ceremony at 11:11am on 11:11:11. How perfect it all feels!!! There is a problem, and we can use some prayers now. Apparently, the Muslim Brotherhood has gotten wind of all the groups who are planning to go into the Pyramid to do sacred ceremony, and they are afraid that one of the larger groups is going to hold hands and form a Jewish star around the pyramid. So, the sudden executive decision of the government is to ban all groups from going inside or anywhere close to the Pyramid on 11:11:11. This is completely unprecedented. We’ll keep you posted as things unfold here. What a beautiful and powerful sacred ceremony this afternoon! Suffice it to say that it could not have gone any better. The prayers and offerings were stunning. Sublime. People poured their hearts and souls into the vase all day. And now the vase is wrapped, sealed and packed like a precious royal mummy in her little tomb. On behalf of everyone, Leslie and I thank you for allowing us the honor of this experience. Update on tonight and the burial: we are living in the moment, and the vase obviously has a mind of its own and knows where it wants to be buried. Turns out the Islamic Brotherhood and the government have become so concerned about anything untoward happening here, that they have closed ALL of the sites for several days. All pyramids. Everything. They want no chance of conflict between Muslims and tourists/Christians/Jews. But Mohammed has made a miracle for us. We are taking camels and horses and going on a journey incognito at 6pm, proceeding out into the desert behind the Great Pyramid as originally planned. We are back, and our little baby is now entombed on the Giza Plateau! She is about 4-feet deep beneath the sands right on the Nilotic Meridian. It all feels very blessed and holy, and we know she’ll be doing her work for Egypt and the world now. We smuggled out a big shovel, and I carried the baby in her treasure chest in a backpack on my back as I straddled my camel, whose name was Mickey Mouse. Our guide Hatem told the Egyptian men who owned the camels and horses that we were New Agers celebrating a birthday and wanted to sing and dance and meditate and be left alone under the moon and stars. Several people stood arm-in-arm to block the view of our digging. We sang and played a crystal bowl to hide the sound of the shovel clanging against the rocks in the sand. In no time at all we were complete, and we ended with making a circle, lying on our backs, gazing at the full moon and stars and praying for protection for the vase. It was a heavenly evening. Hopefully you could feel us. 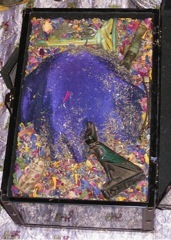 Image of Egypt ETV packed and ready for burial courtesy Mona Roark. 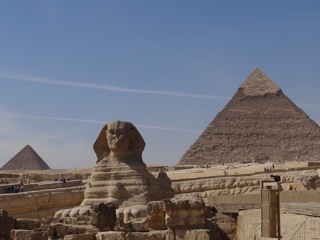 Images of camel & Sphinx courtesy of Lynn Watson. 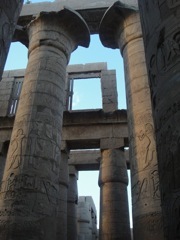 Image of columns courtesy Melody Long. This entry was posted on Thursday, December 15th, 2011 at 5:36 pm	and is filed under Burials. You can follow any responses to this entry through the RSS 2.0 feed. You can trackback from your own site.